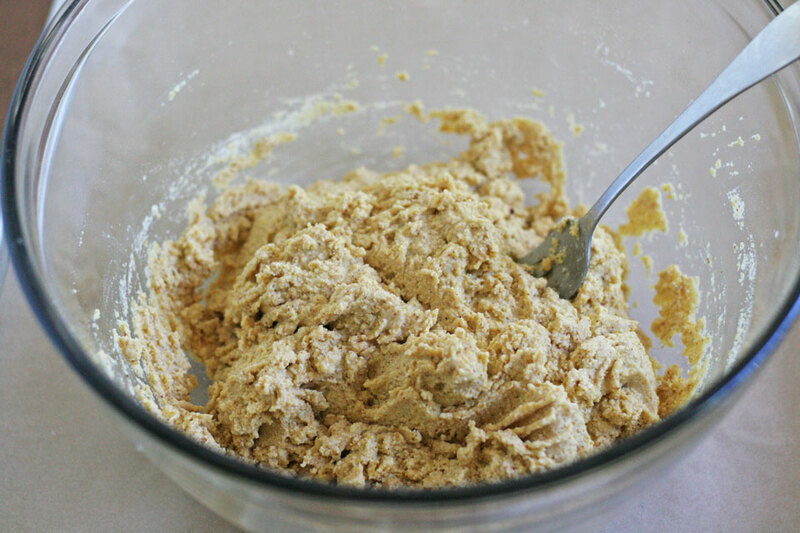 Naturally on May 15th, National Hummus Day, I would make you a hummus recipe right?! And I did! You can use hummus in thousands of ways as we all know. I am in Miami right now, so I thought it would be appropriate to share a Latin inspired recipe turned Mediterranean. Making homemade tostadas is a bit of a treat, especially fried, and they taste better than the store bought ones for sure. But in the spirit of National Hummus Day, Sabra, bathing suits, and Miami I went with a baked tostada, and also made chips. It made sense to go that route, and I just got a new bathing suit and baked chips are the way to go when in bathing suit season. 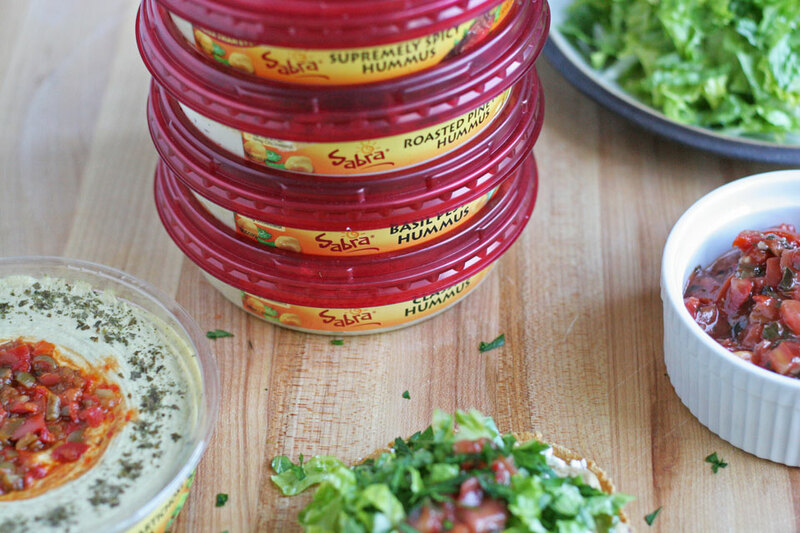 You can celebrate National Hummus Day with Sabra by entering some seriously amazing contests for great prizes, like good old money! 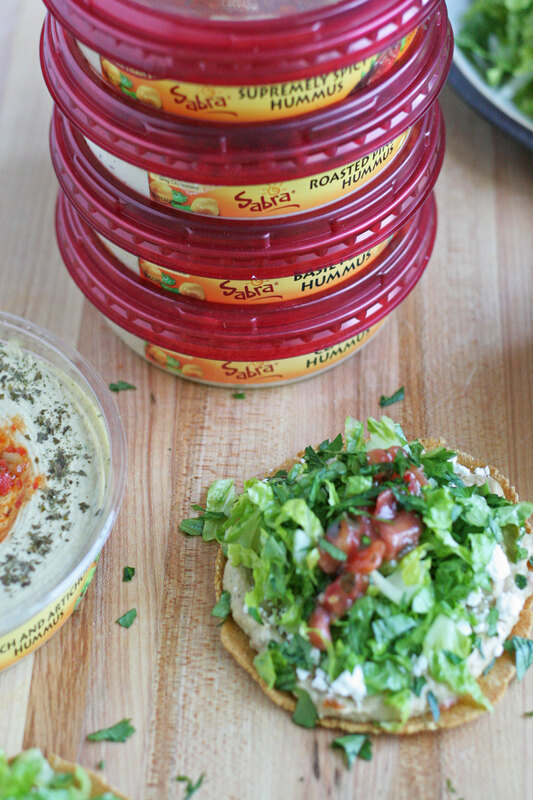 On Twitter or Instagram Sabra is giving away $10, and $100 Visa Gift Cards and Party prize packs for tagging a picture of you and Sabra on #HummusDay May 15. Upload the photo of you, and any Sabra product to Twitter or Instagram. Another awesome way to enter is on Pinterest! Go to Sabras Pinterest page and “Pin it to Win it”, this contest runs until May 15. I made these tortillas from scratch first for optimal freshness, cooked them on the stove, and then baked them in the oven. Typically a tostada is an already cooked tortilla that has been fried, and super good. But for now lets get out bake on! Be sure to go enter the Sabra contests, they are an amazing company. And they are loyal Not Just Baked clients, so lets show them so love too! Because they rock like you do! 1. In a large bowl add the masa harina, chipotle powder, and salt. Whisk to combine. Add the warm water, mix to combine. Cover and allow to rest for 1 hour. After an hour, divide into 12 even pieces. Roll into balls. 2. Using a tortilla press, press into tortillas. If you do not have a tortilla press, use a rolling pin and parchment paper. 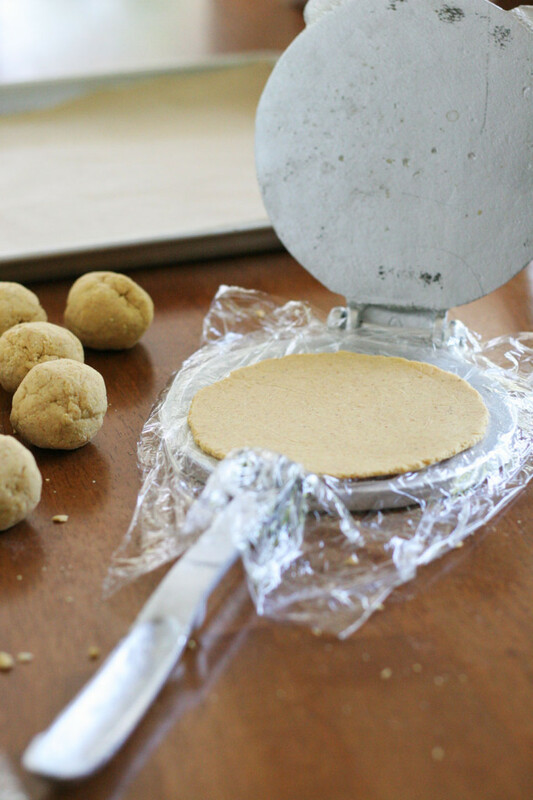 Place a ball in between two pieces of parchment papers and roll out to 1/4 inch thick. Cook each tortilla on a non greased cast iron pan or pan (non-stick not recommended) 2-3 minutes each side. 3. Once cooked, place the tortillas on a parchment lined baking sheet, and bake for 15 minutes or until golden brown. Remove from oven and allow to cool for 15 minutes. 4. 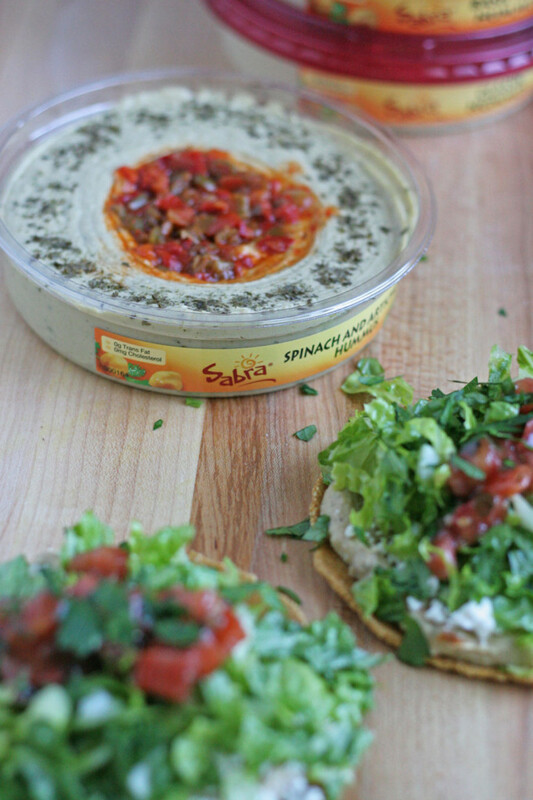 Spread hummus onto tostada first, then sprinkle feta cheese, lettuce, add salsa, and sprinkle with parsley or cilantro. Disclosure: This is a sponsored post. I am a Sabra Tastemaker, and this is a part of my contract as such. As always all opinions are my own.